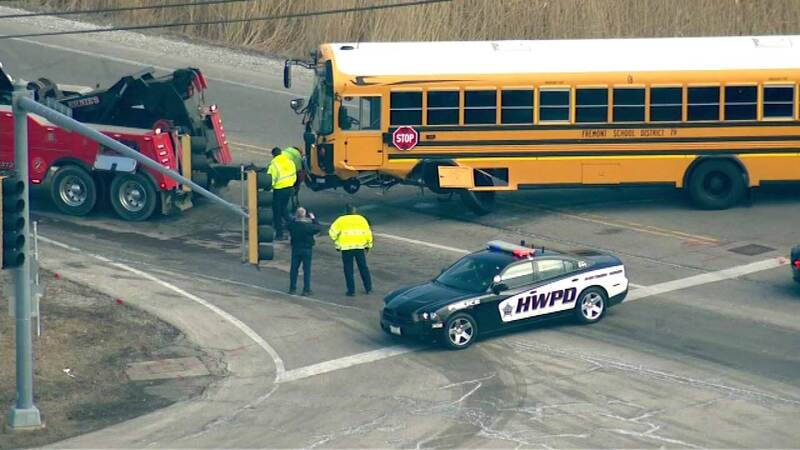 MUNDELEIN, Ill. (WLS) -- A school bus was struck by a car while transporting children to a school in suburban Mundelein, police said. The bus was traveling northbound on Gilmer Road when it was struck by a car at the intersection with Hawley Street around 8:35 a.m. Friday, officials said. The bus was carrying 29 children to nearby Fremont School at the time of the accident. The children were evaluated on-scene but none were hospitalized, officials said. The bus driver was hospitalized with non life-threatening injuries. District 79 officials said the children's parents were notified about the accident and that police are continuing to investigate. "We are grateful for the collaborative efforts of the Countryside Fire Protection District and the Hawthorn Woods police department in effectively and efficiently working with our students and staff during this morning's bus collision," said Dr. Jill Gildea, Fremont superintendent. "The students were immediately assessed and gave a "thumbs up" to personnel who were on-site. We also wish to thank the passersby who stayed with our bus driver until emergency personnel arrived."